From wedding crashing to champagne delivery. Taylor Swift has made her mark on a fair share of weddings, and what she did for one lucky couple in New York on Saturday, March 17, is no exception. 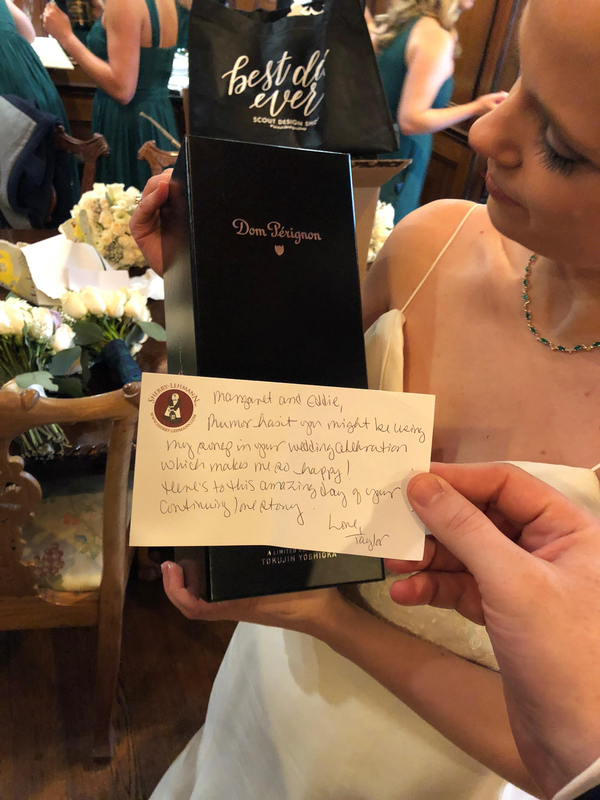 Imagine Edward and Margaret McNoble's surprise when The Carltun at Eisenhower Park in East Meadow, New York, informed them that a bottle of champagne was waiting for them with a special note from Swift attached. "Rumor has it you might be using my song in your wedding celebration which makes me so happy! Here's to this amazing day of your continuing love story. Love, Taylor," the songstress wrote. "When we got to the wedding venue, they told us, 'There [is] a special gift upstairs for you from a very special person,'" the New York-based newlyweds tell Us Weekly. "It was awesome. It was such a great day. With all the moving parts, this was a great surprise! To get a bottle of Dom is a very nice gift, and then to see it's from Taylor Swift is an even better gift!" Swift must have found out that they were using her music in their ceremony — the duo walked in to "Welcome to New York" and shared their first dance to "Love Story." A source says the pop star would have tried to make it to the wedding, but she was in L.A. The "Delicate" singer has a history of making weddings memorable for the bride and groom. She famously crashed a fan's big day in New Jersey in June 2016 to perform "Blank Space" as the newly-married couple danced. Swift also played bridesmaid and gave a risqué speech at her best friend Abigail Anderson's wedding in September 2017.